In the First Year Green Working Hunters, Kelley Farmer and Taken triumphed for the championship award after winning the handy hunter class, earning the second place ribbon in the hunter over fences class, and a fourth place ribbon in yesterday’s hunter over fences class. Taken is owned by Nancy Amling from Palm Beach, Florida. Hunt Tosh and Good Humor, owned by Mr. & Mrs. Douglas Wheeler of Keswick, VA., won the reserve championship ribbon. Not to be overlooked was Morgan Thomas aboard Savant, owned by First Partners, LP. The duo claimed the reserve championship accolade after earning yesterday’s blue ribbon in the over fences class of the Green Conformation Hunters, three red ribbons, and a third place finish in the under saddle class. Victorious in the Second Year Green Hunter division was the horse and rider combination of Louise Serio and Do Tell, owned by Bridget Hallman. The twosome won the championship prize with two first place ribbons in the hunter over fences class and the handy hunter class. They also added a third place ribbon in yesterday’s over fences class and a fourth place in the under saddle class. Following in the Second Year Green Hunter division for the reserve championship tricolor was Tammy Provost and Northern Crown, owned by Northernside LLC. Serio commented, “Not only did Do Tell go well today but he went really well yesterday too. Today he was really on, especially in the handy. This is his first time back and he has not shown since Florida so it was nice to see that he was really ready to go. The verticals on the end surprised the horses a little but Do Tell is very brave. Being surprised is a good thing because he pays a little extra attention and is not bothered by it. The reserve championship honors of the Regular Conformation Hunters went to Sugar Boy with Tammy Provost in the irons. Sugar boy, owned by Wendy Hofmeister and Provost, was consistent in the division earning second place ribbons in all of the classes except yesterday’s over fences class where they won the blue ribbon. The Regular Working Hunters had numerous competitive entries. Achieving the championship honors was once again Hunt Tosh with his mount Lonestar. The pair earned two first place finished in yesterday’s over fences classes, two second place ribbons in the over fences and handy hunter class, and a fourth place in the under saddle class. Tosh exclaimed, “Lonestar was wonderful. We got a 95 yesterday! Lonestar is so good about sighting that distance and going right to it we had no problem with the verticals today.” Following in succession for the reserve championship in the Regular Working Hunters was Rock Star and Louise Serio. Rock Star, owned by Bright Star 158, LLC, earned two second place ribbons in yesterday’s over fences classes, a first in today’s over fences class, and a third in the handy hunter class. 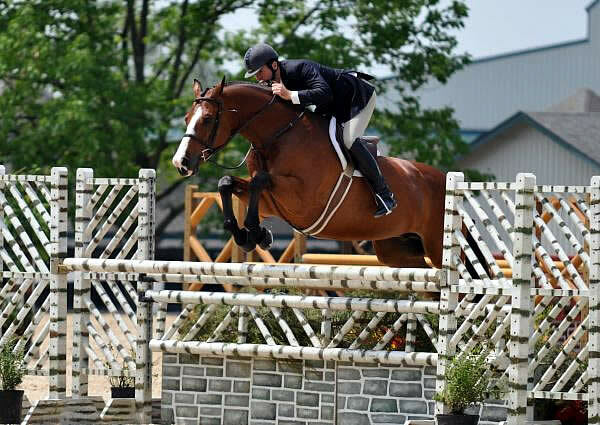 The first week of hunter competition at the Kentucky Horse Park continues through May 16, 2010. The first week is scheduled as a World Championship Hunter Rider (WCHR) recognized hunter week. The Kentucky Spring Horse Show continues tomorrow with the USEF Medal. On Saturday, May 15, 2010, the $15,000 Chronicle of the Horse/USHJA International Hunter Derby Presented by Dietrich Insurance will be held at 6 p.m. in the Main Stadium. Sunday, May 16, ends the first week of the Kentucky Spring Horse Show with championships in the Junior Hunter Divisions.